Thanks to Peter Brady's introduction, we were invited by Djalu' Gurruwiwi to visit his community, spend time making instruments with him and document the process. 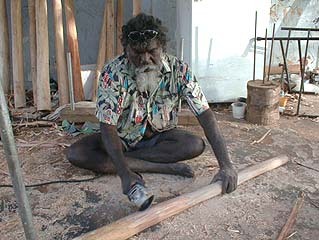 Djalu' is widely known as a custodian of yidaki (didgeridoo) knowledge for his Gaalpu and other related clans of Northeast Arnhem Land, and has become the most famous Aboriginal didge maker in the outside world. Since my first visit in 1999, a website of his own has been created at www.djalu.com. These pictures tell the basic story of the making of the yidaki. Of course, the steps can be rearranged in different orders, and details have been ommitted for the purpose of this quick webpage, but the general idea stands. Read This Paragraph: I'd just like to stress that we are extremely greatful to Djalu' for his openness. People have tried to guard him away as a secret. Djalu' stressed to us repeatedly that he wants people to visit him, to learn about him as a real person. He asked us to show other people the photos of him going about his work, and has, with his community, reviewed and approved these pages for public viewing. 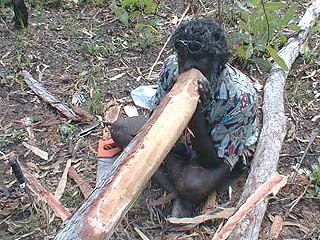 But the Yolngu people, and particularly those like Djalu' whose names carry a lot of weight, are very sensitive about images of themselves circulating out of their control; they are particularly concerned about the internet, with good cause. Please have respect for Djalu' and the privilege he has shared with all of us, and leave these images here! The people pictured have asked that you DO NOT COPY THEM to your own computer, DO NOT PRINT THEM, and DO NOT do anything else you might think to do with them. If nothing else, know that these are our own copyrighted images. I'll sue. I haven't been working for 2 months because of this trip... I could use the money. Okay, I'm off my soapbox, on with the pictures. Incidentally, if you'd like to visit Djalu' with us in the future, drop us a line. First step in making a yidaki... go to where the good ones are. With trees everywhere, it was amazing how far we drove to go cut some down! 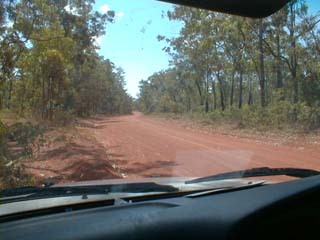 This is the Arnhem Highway, a ways out from the Gove Airport. Remember that famous red dirt from the center? 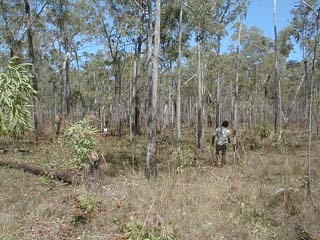 After a bit of offroading, we hopped out of the vehicles, and headed into the bush. Here, we're following Djalu' into the stringybarks. 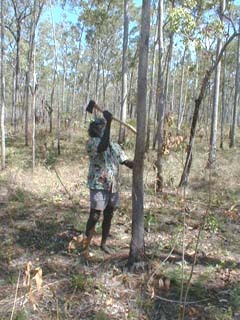 You can see that he's tapping the trees with the blunt end of his axe, checking for a hollow one. 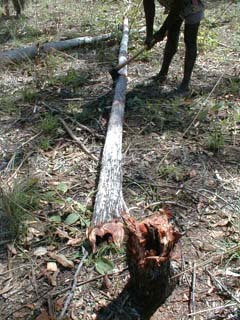 If it seems hollow down low, it gets checked higher up as well, to try and avoid killing a tree that's not quite "ripe." If it sounds good, start chopping! Once it's knocked down, you can see the culprits that do the hollowing... white ants. 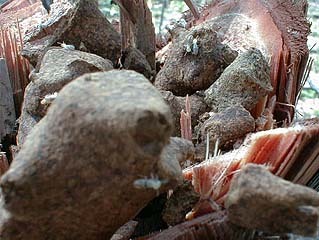 What looks like stones in the tree is the rubble left inside the hollow by the white ants. 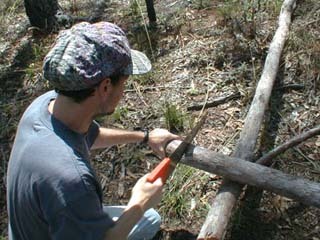 Then, the top of the tree gets chopped, to cut it down to a suitable size. If it's hollow to the top and the passage is somewhat clear, the top gets sawed off to start making a playable mouthpiece. Here's Brandi lending a hand. And some proof that I took breaks from taking pictures to do my part in the work, as well. Then it's time to start removing the bark and carve down the outside a bit. A considerable amount of carving is done on the instruments to take it from tree to the crafted instrument in your hands. And then, play it! No matter how giant and rough it is, Djalu' can play it. 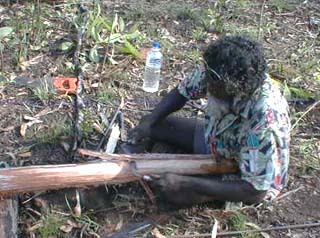 The yidaki gets played at every stage of its construction, showing how much they love the instrument and the process. 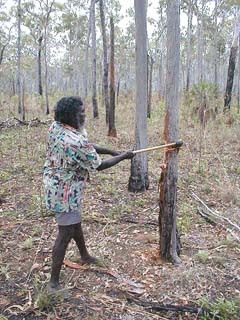 Cut it down, play it, saw it, play it, strip some bark, play it. 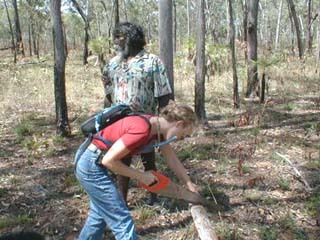 It's as if they're checking if the yidaki is done even though they know it's only been started! It's great... really shows their connection and love for the yidaki. Please do not copy them for your own use without permission!